Keep your scones frozen at all times. DO NOT DEFROST. Pre-heat your oven to 350-375 degrees (350* for convection, 375* for standard). Place frozen scones onto a parchment-lined, ungreased baking sheet - evenly spaced. If you do not have parchment paper, you can use cooking spray on baking sheet. For best results, bake scones on the the middle shelf. Each oven varies, so if scones are baking flat and spreading out, try a slightly higher temperature. Or, if scones are not rising properly (i.e. a hard shell is forming), try lowering your temperature. Bake scones until golden brown and firm to touch, rotating the pan half way through, baking approximately total 24-30 minutes. Baking times vary. Scones with fruit may take a little longer than other scones. Higher elevation will need less cooking time. Push on the scones and if they’re still soft/gewy, they’re not ready. Put back for another 5 min. 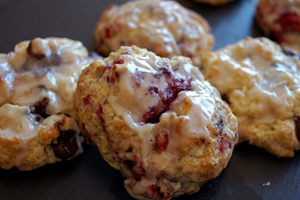 Take scones out of the oven. Serve with a glaze (below), whip cream, clotted cream, plot of butter or they are delicious as is as well. Mix with a whisk until smooth. Pour a hefty teaspoon of glaze per scone while hot. Scones can be refreshe d in the toaster oven for 2-3 min after a day to get the outside crunchy yet still remain moist in the center.